Is your beautiful new ring irritating your finger? Today, we’re going to leave the world of design and manufacture to talk about a problem that can occur with the daily wearing of a ring. For most people, getting a new ring is uncomplicated. It arrives, it goes on the finger and integrates nicely into daily life with little thought needed (other than a regular scrub with soap and water). For others, this act of maintenance has an unpleasant consequence – contact dermatitis. It can be a bit confusing. 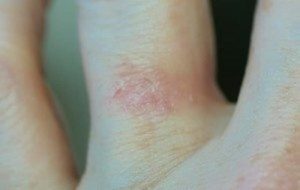 If a rash like this appears on your finger, the automatic assumption is often that you are allergic to the metal in the ring. If the ring has nickel content, or is silver, then you could be right – however, this is not the case with inert metals like palladium and platinum. Unfortunately, you are a sensitive little bunny and your skin doesn’t like something that’s trapped between the ring and your finger. So, whilst you may be vigilant and giving your sparklers a good scrub and rinse at night in the shower, it’s the activity that is going on underneath that will cause the grief. Every time you put something on your hands – hand cream, soap, water, food, cosmetics etc. – it has the potential to get caught up under the band of the ring. For some people, this happens with a plain band; it’s the effect of a constant damp environment. If you have a gem set ring, then you have a lovely hiding hole for ‘treasure’. 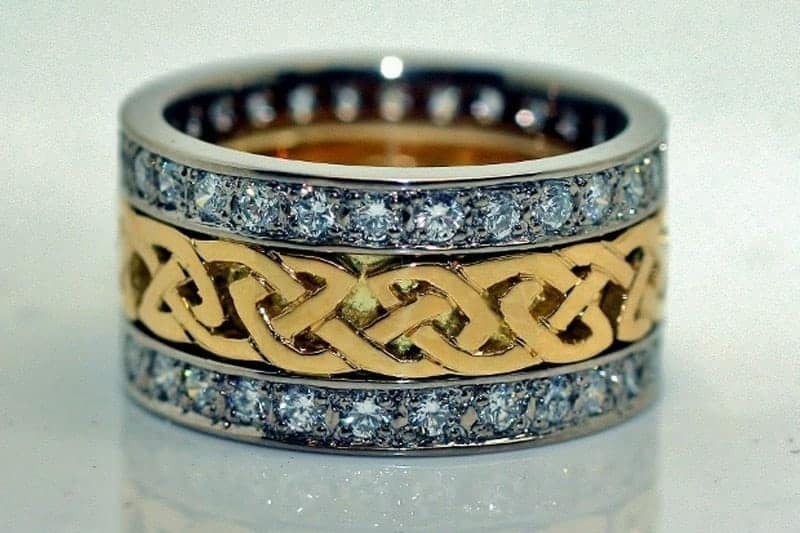 If you take a look at the inside of this ring, you can see exactly what I’m talking about. The setting holes are a perfect place for gunk and grime to accumulate. Unfortunately, once the skin is irritated, it does need a chance to heal. If you’re just reacting temporarily to a substance (rather than actually being allergic to it) then the rash/irritation will go away with treatment. You’ll need to remove the rings until it heals and apply whatever cream you are advised to. After it’s all better, you need to be a little more thoughtful about how you treat your rings/hands. It isn’t advisable to use commercial cleaners, as they can often be a source of irritation. As long as you don’t have porous gems in your rings (i.e. don’t do this with pearls), then a soft nailbrush or toothbrush with some mild soap and water, a good rinse and a thorough dry with a lint free cloth will do the trick. So, the bottom line is, even with rings, hidden dangers can lurk below the surface. Here’s to living without irritation. If you’d like to know more about choosing the right precious metal for your jewellery, take a look at this blog article.